Berwick Rangers are to mark the 50th anniversary of arguably the most famous game in their history – the 1-0 win over Glasgow Rangers in the Scottish Cup in 1967. A celebratory dinner is being held on January 20, eight days prior to the actual anniversary date of January 28. Several former players – Doug Coutts, Alan Ainslie, Russell Craig, Gordon Haig, John Keith and Jim Riddell from Berwick Rangers, and Dave Smith and Willie Johnston from Glasgow Rangers – will be in attendance. Berwick Rangers were relative newcomers to the Scottish Football League, having only joined in 1955. In May 1964, Glasgow Rangers had tried to force league reconstruction, which would have meant Berwick Rangers and four other teams being expelled from the league. The five teams went to court to fight this proposal, but the court found in the Glasgow club’s favour of league reconstruction. The teams appealed to the Inner House of the Court of Session, and with support from Celtic’s chairman Robert Kelly, this proposal was eventually dropped. Berwick Rangers had met Rangers three times previously and had lost each time, 4-0 in the Scottish Cup at Ibrox in 1953, 3-1 in the Scottish Cup at Shielfield in 1960 and 3-1 in the semi-final of the 1963-64 Scottish League Cup at Hampden Park in October 1963. In the 1966-67 Scottish Cup competition, Glasgow Rangers, the holders, were given a bye to the first round and were drawn against Berwick Rangers, to be played on January 28, 1967. Berwick had already played in two preliminary rounds. In the first preliminary round they had beaten Vale of Leithen 8-1 on December 17, 1966, at Victoria Park, a club record cup win and a record away win. In the second preliminary round they had beaten Forfar Athletic 2-0 on January 7, 1967, at home. The Glasgow Rangers team featured nine players with international caps, while Berwick Rangers were composed of part timers. At the time of the match, Rangers were in second place in the Scottish League Division One and Berwick Rangers were 10th in Scottish League Division Two. Some 13,365 packed into Shielfield Park that Saturday, a record attendance at the ground. From kick-off, the Glasgow side immediately went on the attack, forcing three corners in the opening five minutes. Alex Smith, Willie Henderson and Willie Johnston all going close. Henderson went down in the box under a challenge from Kilgannon, but his call for a penalty was dismissed. Rangers continued to press and Coutt’s intervention prevented Alex Smith from a near certain scoring opportunity. By the half-hour mark, Rangers had forced 10 corners. However, in the 32nd minute, Berwick’s Dowds and Christie carved open the Rangers defence. Christie passed to Sammy Reid, who blasted it past Martin in off the post. Two minutes later, Christie had a golden chance to make it 2-0, but his half-hit shot was comfortably saved by Martin. Apart from a shot from John Greig, which went narrowly wide, Berwick comfortably saw out the first half. In the second half, Berwick continued to trouble Rangers with a number of chances. In the 65th minute, following a collision with Jock Wallace, Willie Johnston was stretchered off with a broken leg. Johnston was substituted in the 66th minute by Davie Wilson, who had scored three goals against Berwick Rangers when they met in 1960. Despite frantic attempts from Wilson, Greig and George McLean, they were unable to penetrate the Berwick goal. It wasn’t all one-way traffic, however. Berwick’s Alan Ainslie forced Norrie Martin into a fine save, and also hit the post. Wallace played the entire second half in goal, despite losing a contact lens in the mud. At the final whistle, Greig sportingly shook the hand of every Berwick player as they left the field. The defeat of Rangers sent shock waves around Scottish football – it was the first time they’d been knocked out in the first round in 30 years and the first time they’d lost to a second division club. Despite being prolific strikers for Glasgow Rangers, Jim Forrest and George McLean were made scapegoats for the defeat and never played for the club again. Within weeks they were transferred to Preston North End and Dundee respectively. The loss of McLean and Forrest allowed two notable players their chance with Rangers. Sandy Jardine was drafted from the reserves to the first team and went on to play 674 games for Rangers. Symon paid a then record fee between two Scottish clubs of £65,000 to sign striker Alex Ferguson from Dunfermline Athletic that summer. 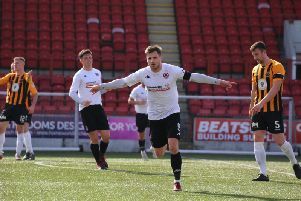 Goal hero Sammy Reid had to go back to his job as a gear cutter in an engineering yard on the Sunday after the game to make up the time he had been given off earlier in the week for training. Rangers’ early exit from the Scottish Cup is said to have made Celtic’s treble win that year easier, and even sown the seeds of Celtic’s dominance of Scottish football in the late 60s and early 70s. Berwick were drawn against Hibernian in the second round away at Easter Road, but lost 1-0 in front of a crowd of nearly 31,000, though Berwick had a goal by Ken Dowd disallowed in the first half and Wallace saved a penalty. Glasgow Rangers eventually went on to reach the final of the European Cup Winners’ Cup that season, but lost 1-0 to German side Bayern Munich. Two years later, Berwick manager Jock Wallace left to become coach at Hearts and subsequently went on to coach at Rangers, becoming their manager in 1972. Dave Smith, one of the Rangers players that day, managed Berwick between 1976 and 1980, leading them to their first League championship in 1979. Exactly 11 years later, the teams met again at Shielfield in the 1977-78 Scottish Cup, with Smith and Wallace on opposite teams from 1967. This time the result went to form with Rangers winning 4-2.